Unlike other exports like Joomla and WP, Themler for DNN does not work with real DNN content. DNN skin uses dummy content. In works similar to Artisteer 3.x (before Content Editor). Currently you can work with DNN themes on the cloud and in Themler Desktop only. Theme editing is not available for your local/hosted CMS. Adjust the theme in the way you want. Save the changes using Save or Publish options. NOTE: The theme must be downloaded without Themler. In this case the structure of the archive will allow to install this theme via DNN Install Extension Wizard. NOTE: Slogan control is not supported in DNN themes. The Logo control is available in Themler under the Insert Tab >> More. If you specify image in Themler the default DNN logo will be ignored. <div class="panel panel-default pull-right"> <div class="panel-heading"><h3 style="margin: 0;">See Also</h3></div> <!-- List group --> <ul class="list-group"> <li class="list-group-item"><a href="http://answers.themler.com/articles/49607">How To Install DNN Skin</a></li> <li class="list-group-item"><a href="http://answers.themler.com/articles/49639">Themes and Module Containers</a></li> <li class="list-group-item"><a href="http://answers.themler.com/articles/49640">DNN Places</a></li> </ul> </div> - How to start creating a DNN theme in Themler Desktop - How to start creating a DNN theme on Cloud - How to Edit Headline - How to Edit Logo Unlike other exports like Joomla and WP, Themler for DNN does not work with real DNN content. DNN skin uses dummy content. In works similar to Artisteer 3.x (before Content Editor). Currently you can work with DNN themes on the cloud and in Themler Desktop only. **Theme editing is not available for your local/hosted CMS. 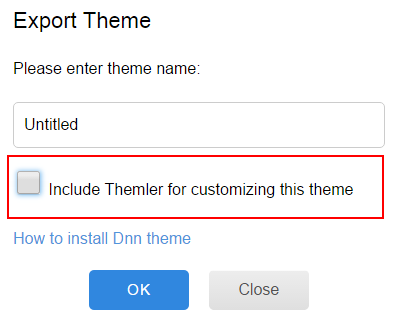 ** ### How to start creating a DNN theme in Themler Desktop 1. Start Themler Desktop. 2. Choose DNN theme. !start-dnn2.png! 3. Adjust the theme in the way you want. 4. Save the changes using Save or Publish options. 5. Use File >> *Export as ZIP* option to export theme in DNN skin format: !dnn-export3.png! **NOTE:** The theme must be downloaded without Themler. In this case the structure of the archive will allow to install this theme via DNN Install Extension Wizard. !dnn-export4.png! <!-- ### How to start creating a DNN theme on Cloud 1. To start working with Themler for DNN please go to http://themler.com. 2. Click *"DOWNLOAD NOW"*. 3. Find DNN export and click **"Try Online"**. !start-dnn.png! Since this is the cloud the lifetime of virtual machine is quite short. 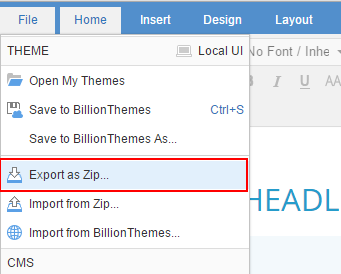 **To save the theme for further editing you should export theme as ZIP with Themler included:** !dnn-export3.png! !dnn-export2.png! To continue editing the skin you should start Themler on cloud and **Import theme from ZIP**: !dnn-import.png! To install theme in DNN you should **Export it as ZIP** without Themler included: !dnn-export4.png! --> ### Headline The text of the Headline control can't be edited in Themler. This control outputs site title specified under the DNN Admin >> Site Settings >> Title and navigates to the portal home page: !dnn-site-settings.png! **NOTE:** Slogan control is not supported in DNN themes. ### Logo The Logo control is available in Themler under the **Insert Tab** >> **More**. If the image is not specified in Themler ("empty image") the default DNN logo will be used: DNN Admin >> Site Settings >> Appearance: !dnn-logo.png! If you specify image in Themler the default DNN logo will be ignored.